Getting Chrome on an Android TV device is easy. Here’s how. On the computer, navigate to Google Play. Click on Apps in the left-hand panel. Type Chrome in the search box and press Enter. Choose your Android TV device from the dropdown menu. Give the app a few minutes to download and install, and you should find see it on the leanback launcher on your Android TV device. Note: You will need to launch Chrome from the Apps list in the Settings menu, or use a sideload launcher for Android TV 3 Easy Ways to Access Sideloaded Apps on Android TV 3 Easy Ways to Access Sideloaded Apps on Android TV If you have sideloaded apps on your Android TV, you need a good way to access them. Read More . 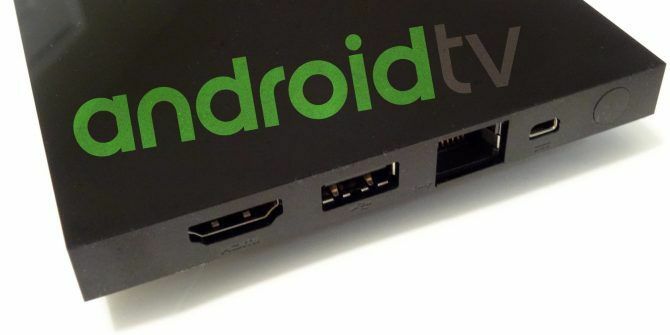 Very few people know about this trick—even seasoned Android TV users. If your Android TV device supports voice input, all you need to do is press the appropriate button on your remote and say Launch Chrome. The device will ask whether you want to install the app. Click Agree, and Chrome will be ready to use in seconds. Regardless of which method you use, there’s one setting you need to change when you launch Chrome for the first time. Click on the three vertical dots, scroll down, and mark the checkbox next to Request Desktop Site. It will ensure the app takes full advantage of your TV screen’s real estate. Once you’re done with Chrome, take a look at this list of essential Android TV apps you can install next. We’ve also rounded up some great Android TV launcher apps The 7 Best Android TV Launcher Apps The 7 Best Android TV Launcher Apps It's easy to replace the Android TV launcher! Here are the best Android TV launcher apps you should consider using. Read More . Explore more about: Android TV, Google Chrome, . Method 2 : Use your voice did not work. It said Chrome not available for this TV or to that effect -TV with Android Oreo 8.1. I recommend a unique novelty - Diary Lifestyle. i tried the 2nd way and didnt work. I tried it in every possible place. I tried it b4 uninstalling chrome and it worked, but navigation through Chrome doesnt seem to be supported.i uninstalled it trying to see what happens. It didnt work. I will try the 1st way which I doubt. Side installing is the only way. And did anyone figure out that unsupported apps do not show on the app original menu!? I used your voice method. Thank you, it worked perfectly. I downloaded it and can open it in the apps settings but it won't show up with the other apps on the home screen. Did not get confirmation email. Hovever, how do I get my cursor to the 3 dots? 5. typed in Chrome and and hit enter. I waited 10 minutes then pressed the microphone button on my TV remote and said "Launch Chrome"
I Clicked the drop box and couldn't select any, all grayed out. What am I doing wrong? Method 2 doesn't work at all. It just gives you unrelated/useless search results. Method 1 does work, but it doesn't show up in the app launcher. I have to launch it from the list of apps in the settings menu. Navigating Chrome (or any browser) on a TV is a lot easier with a wireless mouse and a keyboard (wired or wireless). For those saying why bother with a browser for your TV?, I find it useful because TV station websites give you more access to their shows/videos than their apps do. Done it was a piece of cake to do it and showed up instantly ?? I installed Chrome on my Mi box through downloading apk on my computer and then through USB flash drive installed on device. You need to have wireless or Bluetooth mouse or a combination of mouse and keyboard to use chrome on Mi box. I use a USB hub to attach additional accessories to Mi box. Yes, it can be installed, but it's completely useless. I have a xiaomi mi box, and I can't do anything in chrome. Can't press any links, just to go up and down and write in address line. That's it. You need a Bluetooth keyboard with touchpad.